-Rub thawed lamb chops with olive oil and sprinkle both sides with rosemary, granulated garlic, salt and pepper. Rub seasonings into the meat and let sit at room temperature for 30 minutes to warm up a bit. -Coat bottom of cast iron skillet with a thin film of olive oil and heat over medium high heat until the oil is shimmering. Don’t burn the oil. 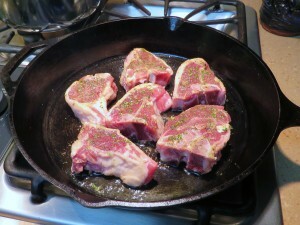 -Arrange chops in hot skillet and don’t move them till they’ve browned nicely on the bottom. 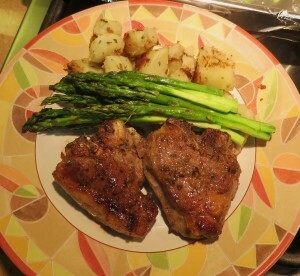 -Turn the chops, browned side up, and put pan in the hot oven. Lower the heat to 375 degrees and roast till desired doneness. We like ours medium rare so that only takes about 4-5 minutes. -Remove chops from pan and place on a plate; cover with another plate or a piece of foil to rest the meat for 5 minutes and allow the juices to settle.